Fall for the livable comfort, performance, and style of the Cloud from On™. On footwear inspires a more efficient running style by promoting a more forward foot strike, as well as a centered and energized running position. 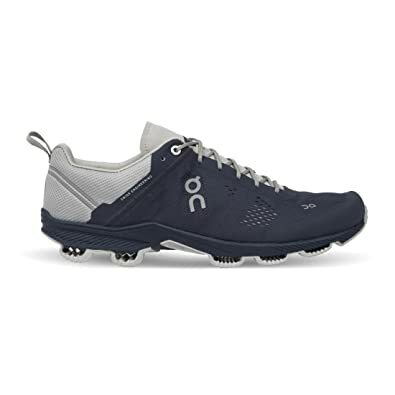 On delivers a blend of the injury protection found in traditional running shoes, with the natural ride of its lightweight counterpart. Versatile trainer, ideal for runners and similar athletes. Mesh upper with synthetic overlays that provide structural support where it is needed. Slip-on, speed-lacing system promotes a glove-like fit. Flexible heel strap adjusts to the foot’s movements while keeping it comfortably locked down. Reflective hits boost visibility in low-lighting conditions. Differential: 6 mm CloudTec® cushioning technology is only active during the foot strike, and becomes firm for an efficient toe-off. CloudTec sole unit is made from Zero-Gravity foam to combine minimal weight with exceptional cushioned comfort. 16 Cloud-pods are directly attached to the Speedboard, reducing bulk and allowing the sole to adapt to your footprint. A central channel between the medial and lateral sides of the foot lets the CloudTec sole adapt to the individual movement path of the foot. Deep flex grooves for an enhanced range of motion and maximum flexibility. Imported. Measurements: Weight: 10 oz Product measurements were taken using size 11, width M. Please note that measurements may vary by size. Benefits: On delivers a blend of the injury protection found in traditional running shoes, with the natural ride of its lightweight counterpart. 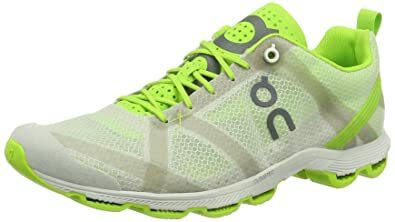 Ideal for all types of runners looking for a cushioned, responsive trainer and racing shoe. Breathable mesh upper with synthetic overlays that provide structural support where it is needed. Reflective hits boost visibility in low-lighting conditions. Molded heel counter helps comfortably lock the foot in place. Heel pull loop for an easier on and off. Lightly padded tongue and collar for added comfort. Breathable fabric lining offers a great in-shoe feel. Molded insole with built-in arch support. Speedboard supplies enhanced flexibility that converts landing power into forward movement. High-grade EVA midsole for lasting performance. Differential: 7 mm CloudTec cushioning technology is only active during the foot strike, and becomes firm for an efficient toe-off. CloudTec rubber outsole delivers lasting durability, while honeycomb traction pattern provides reliable grip. Imported. Ride that sweet, plush, responsive wave by lacing into the Cloudsurfer from On™. 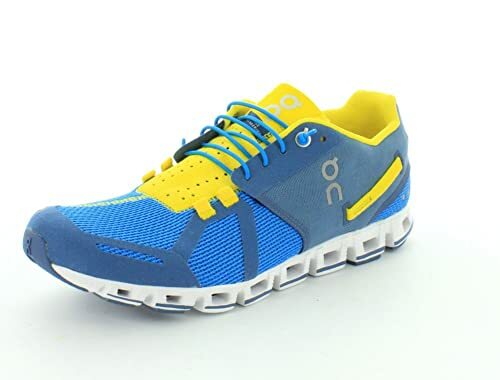 On footwear inspires a more efficient running style by promoting a more forward foot strike, as well as a centered and energized running position. 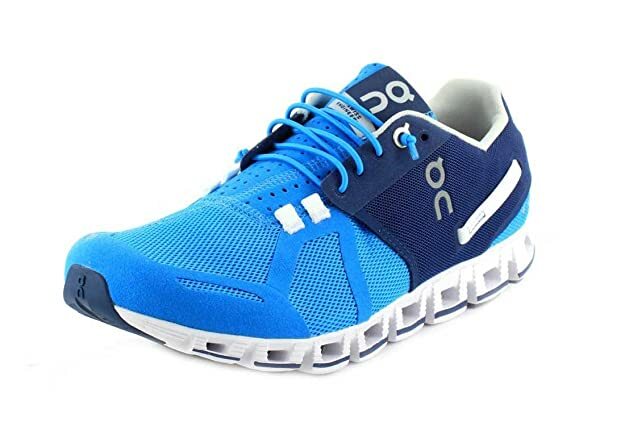 Benefits: On delivers a blend of the injury protection found in traditional running shoes, with the natural ride of its lightweight counterpart. 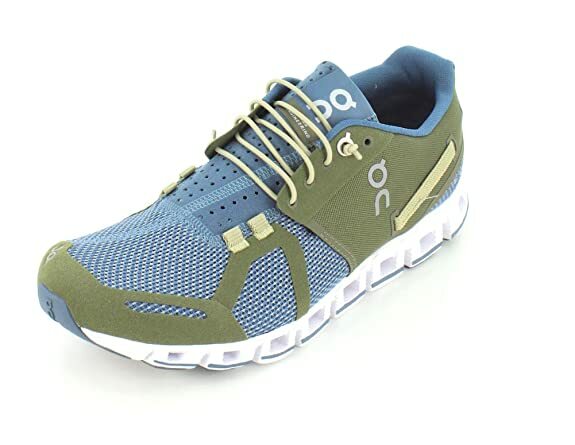 Ideal for all types of runners looking for a cushioned, responsive trainer and racing shoe. Breathable mesh upper with synthetic overlays that provide structural support where it is needed. Reflective hits boost visibility in low-lighting conditions. Molded heel counter helps comfortably lock the foot in place. Heel pull loop for an easier on and off. Lightly padded tongue and collar for added comfort. Breathable fabric lining offers a great in-shoe feel. Molded insole with built-in arch support. Speedboard supplies enhanced flexibility that converts landing power into forward movement. High-grade EVA midsole for lasting performance. Differential: 7 mm CloudTec® cushioning technology is only active during the foot strike, and becomes firm for an efficient toe-off. CloudTec rubber outsole delivers lasting durability, while honeycomb traction pattern provides reliable grip. Imported. Measurements: Weight: 14 oz Product measurements were taken using size 11, width M. Please note that measurements may vary by size. Weight of footwear is based on a single item, not a pair. Welcome the Cloudcruiser to the On running family! It is designed to provide an ideal level of stability for seasoned runners looking to increase endurance on and off the road. Ideal for all gait types, high-impact and long-distance runners. Lightweight, three-dimensional woven mesh upper with synthetic overlays. Lace-up closure with a unique design that helps evenly distribute pressure for reduced irritation. Heel pull loop. Lightly padded tongue and memory foam collar. Breathable textile lining promotes a great in-shoe feel. Removable foam insole. Differential: 7 mm CloudTec® system features 15 high-profile Clouds made of durable, rebound rubber that provide exceptional impact protection. Imported. Measurements: Weight: 13 oz Product measurements were taken using size 12, width M. Please note that measurements may vary by size. 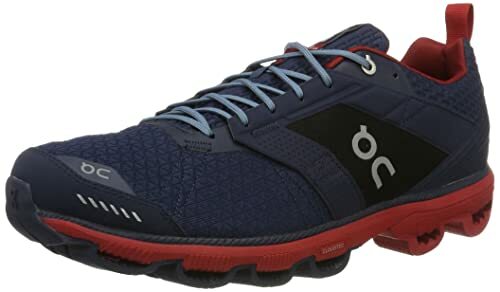 Built for comfort and fun, the On Cloudflyer takes cushioning and stability to the next level while still retaining the lightness of a fast running shoe. Its patented CloudTec system is engineered with Zero-Gravity foam, ensuring these shoes weigh just 10 ounces. It’s ultra light, yet incredibly stable and supremely cushioned. Benefits: On delivers a blend of the injury protection found in traditional running shoes, with the natural ride of its lightweight counterpart. Built for the efficient runner who has a need for speed, on and off road. Lightweight is highly breathable to help keep the foot cool. Skeleton-style synthetic upper and overlays are ultrathin, yet provide support in all the right places. Webbing heel counter helps comfortably lock the foot in place. Heel pull for an easier on and off. Sueded tongue and plush collar for added comfort. Two-layer inner sock for added comfort. Non-slip fabric lining. High-grade EVA midsole for extended durability. Differential: 5 mm Full-length Speedboard distributes pressure evenly across Cloud elements. CloudTec cushioning technology is only active during the foot strike, and becomes firm for an efficient toe-off. 18 ‘Cloud’ pods maintain a close-to-the-ground profile for speedy performance with a surprising amount of shock protection. Minimalistic Cloudtec brings the foot closer to the ground. It cushions upon foot strike, then interlocks for a firm push-off. CloudTec rubber outsole delivers high-energy return and lasting durability, while honeycomb traction pattern provides reliable grip. Imported.